Looking for a wireless phone charger that doesn’t look like another dock or charger? Meet PowerPic, the picture frame that wirelessly charges your phone. PowerPic’s hidden Qi charger is capable of providing up to 10 watts of fast charging power. Just set any Qi-compatible phone inside the frame to begin charging. The contemporary frame is made of New Zealand Pine and holds any 5” x 7” photo. PowerPic is, hands down, the best looking wireless phone charger - that you’ll never see. The picture frame that wirelessly charges your phone. Compatible with most wireless charging phones including iPhone x, XS, XS Max, XR, 8/8 Plus, Pixel 3, Pixel 3XL, Samsung Galaxy Note 9/S9/S9+, Note 8. Here’s a fun PowerPic trick. Print a 5”x7” photo of your favorite place, like a lake, and place it in PowerPic. Next, find a selfie or family photo from your lake trip and set that image as your phone’s wallpaper. Then use that phone wallpaper to “complete” the lake photo in PowerPic. We created a few fun “complete the picture” examples with iconic images from the Eiffel Tower to the Rockefeller Center Christmas tree. Dimension: 6.5 x 8.5 x 1.25 inchs., Weight: 1.9lbs. PowerPic is the best way to recharge your smartphone while preserving your space and your interior. This induction charger will easily find its place on a desk, a bedside table or a chest of drawers. 2-in-1, it saves you from accumulating all kinds of accessories not always very "aesthetic". 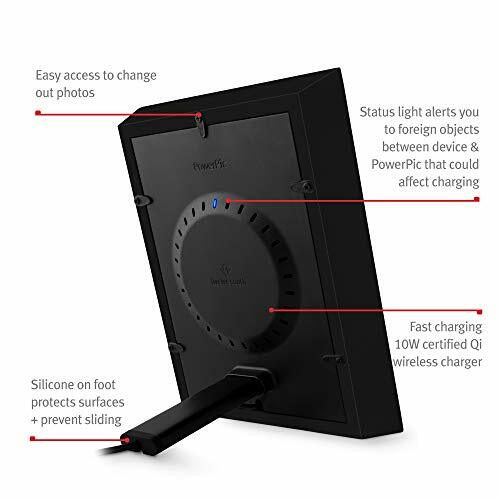 The PowerPic is the new high-tech photo frame that recharges your phone indiscriminately. Just place your smartphone against the photo to start loading. PowerPic even works with hulls up to 3 mm thick. Its frame is made of New Zealand pine and can hold a photo of 13 x 18 cm. You will have the choice between two photos to be able to use it immediately, but free to you to put yours! PowerPic inductively charges any Qi compatible smartphone and allows fast charging up to 10 watts. 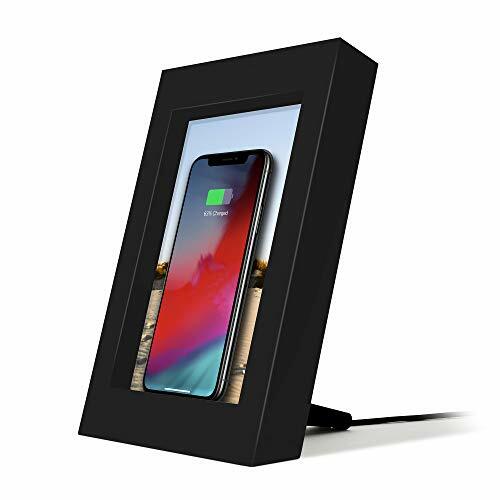 A light at the back of the frame tells you when your smartphone is fully charged and warns you if a foreign object, such as a bank card with a chip, prevents your smartphone from charging properly. The USB-C to USB cable provides can be plugged into any USB port, computer or AC adapter. PowerPic is more than just a pretty frame. It's much more fun to see a family or holiday photo than a phone charger or cable. Tip: Let your phone complete the photo. Print a photo of your favorite place and put it in PowerPic. Then look for a family photo or a selfie of your trip to this place and set this image as your phone's wallpaper.